Some people have what it takes to survive in nature. Then again, so do most slugs. What you want to do is look damn good in nature. This company gets you: Nemo, offering some of the most innovative design seen at a campsite since the invention of s’mores, online now. Imagine the bold design of Frank Lloyd Wright inhabiting the adventuring spirit of Bear Grylls. Now imagine the resulting spirit takes you camping. Also imagine that the spirit has a portable shower that fits in your backpack. Because this site does. But mainly it’s a site selling tents. They have 28 different kinds, each with its own unique character. Some are little more than a tarp with a well-placed zipper. Others offer inflatable beams instead of tent poles—the whole shebang folds to the size of a cantaloupe. But when fully upright, all of them have the sharp angles and precise cantilevers not usually found in nature. Unless Jetsons architecture counts as nature. 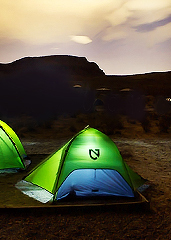 Once your tent is set up, you’ll crawl into one of their sleeping bags. In addition to high-tech fabric, the big innovation is a shape that they call the Spoon, designed for people who sleep on their side. Though their standard version comes in a double-occupancy size called Tango Duo 30F. You’ll have to invent the Tango Trio.